I’m presenting a morning session with Karen Montgomery on Monday in Amarillo, Texas, on “Social Media Guidelines for Schools” for the “Teaching the 21st Century Student” conference. We are going to use several stories and case studies in the presentation to encourage discussion about the issues social media raises for educators as well as students. One of the situations we plan to share I learned about in 2010 from a teacher who does not want to be identified, because of the sensitive nature of what happened and the fact that the student would probably be identified (and embarrassed) if the teacher told the story publicly. Rather than simply tell the story at the conference, I thought it might be effective to write a script and create a text-to-video version of the story using Xtranormal. I was going to use the green screen effects of iMovie 11 to put each character in my video in a different location, rather than the same scene (which Xtranormal allows) but iMovie’s green screen settings didn’t like my teacher character’s hair color. (It turned his blonde hair transparent also, along with the green background.) As a result, I’m just sharing this with the green screen background. Hopefully this will still be more effective than if I’d just told this story to setup the context. What do you think would be the best “discussion questions” to provide to our conference participants Monday, after watching this video scenario? One of the main thoughts I have is that if their school district and state goes the way of Virginia, a student in this scenario today could be dead. Another weird, frustrating thing I ran into when editing this video in iMovie 11 was that initially, I couldn’t get iMovie to play or export the video with the opening and closing still image bumpers. I created the images in Keynote, exported them as JPGs, and then dragged them into the iMovie project. They appeared in the project window, but wouldn’t show in the preview window when the video played. When I imported the images into iPhoto and THEN added them to the project within iMovie, they worked fine. Strange. This is the “script” I created using Xtranormal’s web-based moviemaking interface. I created an Xtranormal account quite awhile ago but hadn’t ever created my own movie until today. As a result (I guess) my “free” 300 points on the site had expired. This one minute and forty second video “cost” me 111 Xtranormal points to create. 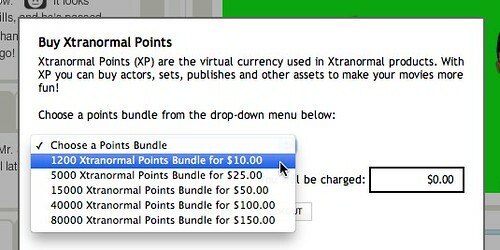 I opted to purchase the least expensive “bundle” of Xtranormal points on the site (1200) for $10 US. I also opted to download what was touted as a HD version of the video. (It was just 640 x 320.) That cost 120 more points. If I’m doing my math right, this means the monetary cost of this video tonight was about $2. I think it was worth it! If you haven’t given Xtranormal a try and introduced it to your students, you should check it out. Chris Lehmann shared a sad but accurate video about “educational reformers” created with Xtranormal this past week that got me thinking again about using the tool. GoAnimate is a similar tool one of my cohort teams at the Learning.2010 conference in Shanghai used for their final visual literacy project. It’s quite amazing what can be done with some creative thinking, powerful tools like Xtranormal and GoAnimate, and a few digital dollars these days.